Cosmologically speaking, the Milky Way and its immediate neighborhood are in the boondocks. In a 2013 observational study, University of Wisconsin–Madison astronomer Amy Barger and her then-student Ryan Keenan showed that our galaxy, in the context of the large-scale structure of the universe, resides in an enormous void — a region of space containing far fewer galaxies, stars and planets than expected. Now, a new study by a UW–Madison undergraduate, also a student of Barger’s, not only firms up the idea that we exist in one of the holes of the Swiss cheese structure of the cosmos, but helps ease the apparent disagreement or tension between different measurements of the Hubble Constant, the unit cosmologists use to describe the rate at which the universe is expanding today. Results from the new study were presented June 6 at a meeting of the American Astronomical Society. The reason for that is that a void — with far more matter outside the void exerting a slightly larger gravitational pull — will affect the Hubble Constant value one measures from a technique that uses relatively nearby supernovae, while it will have no effect on the value derived from a technique that uses the cosmic microwave background (CMB), the leftover light from the Big Bang. The new Wisconsin report is part of the much bigger effort to better understand the large-scale structure of the universe. The structure of the cosmos is Swiss cheese-like in the sense that it is composed of “normal matter” in the form of voids and filaments. The filaments are made up of superclusters and clusters of galaxies, which in turn are composed of stars, gas, dust and planets. 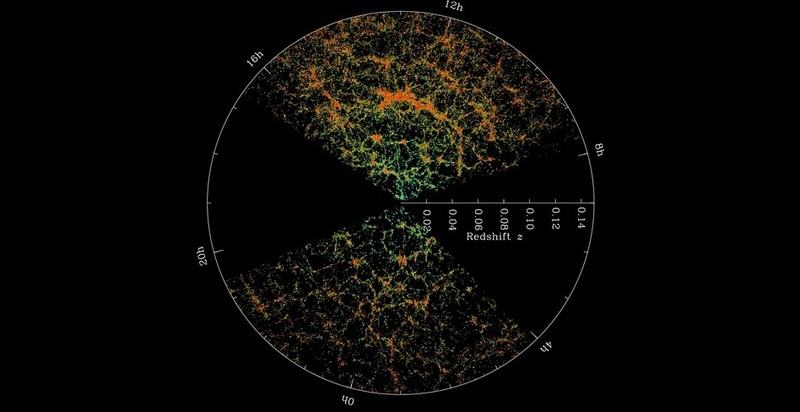 Dark matter and dark energy, which cannot yet be directly observed, are believed to comprise approximately 95 percent of the contents of the universe. The void that contains the Milky Way, known as the KBC void for Keenan, Barger and the University of Hawaii’s Lennox Cowie, is at least seven times as large as the average, with a radius measuring roughly 1 billion light years. To date, it is the largest void known to science. Hoscheit’s new analysis, according to Barger, shows that Keenan’s first estimations of the KBC void, which is shaped like a sphere with a shell of increasing thickness made up of galaxies, stars and other matter, are not ruled out by other observational constraints. The bright light from a supernova explosion, where the distance to the galaxy that hosts the supernova is well established, is the “candle” of choice for astronomers measuring the accelerated expansion of the universe. Because those objects are relatively close to the Milky Way and because no matter where they explode in the observable universe, they do so with the same amount of energy, it provides a way to measure the Hubble Constant. A direct comparison can thus be made, Hoscheit says, between the ‘cosmic’ determination of the Hubble Constant and the ‘local’ determination derived from observations of light from relatively nearby supernovae.